Published in Toronto and distributed directly to people living and working in the Waterfront and Downtown area. Reaching over 100,000 readers with every issue; it is the only community-based magazine distributed directly to residents and businesses by Globe and Mail newspaper and Canada Post. The magazine appeals to the unique lifestyle and interests of your target market: affluent, cosmopolitan and upscale. The Waterfront has been a hot topic with great interest being paid to the revitalization and plans to reinvigorate the area. The many community associations have been very active in all areas of the neighbourhood. The cultural diversity ranges from concerts at The Hummingbird Centre, Roy Thomson Hall and The Molson Amphitheatre to theatrical events at The Princess of Wales Theatre and The Royal Alex Theatre. Harbourfront Centre provides year round activities for all ages and cultural interests. The outdoor lifestyle lends itself to running, cycling or roller blading along the Waterfront as well as sailing and enjoying the many activities on the Toronto Islands. The Summer offers an endless array of sights and activities. Many of the waterfront residents enjoy spectacular views of the cityscape and Lake Ontario. This lifestyle encapsulates design and style along with contemporary architecture; contributing to the spectacular Toronto skyline. 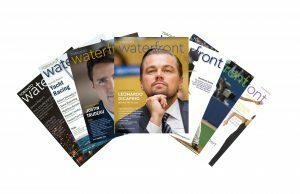 The many philanthropic efforts of the people in the community are recognized by Toronto Waterfront Magazine. The contributions made by these outstanding community members will be featured in each issue.